Yesterday marked the official pre-launch of EQ2's fourteenth expansion, Planes of Prophecy. The actual launch doesn't come until the end of November, the 28th to be precise, but if you can't wait you can pre-order now and get instant access to the beta. I happened to be at home when the livestream began and I didn't seem to have anything better to do than watch it. I went to Twitch first, assuming that's where it would be, but apparently Twitch is so last year now. Facebook Live is the place to go. That made it a first for me. I don't have a Facebook account but apparently that doesn't matter. And I have to say that it was a cleaner interface and a less fussy experience all round than Twitch. The forty-five minute promo was MC'd by the somewhat nervous Community Co-ordinator Roxxlyy, who looked, in the words of Ed Reardon, about twelve years old. As reported by the late EQ2Wire, she was an intern until very recently but SOE and DBG have a long history of battlefield promotions so that's not too surprising. Roxxlyy, Kander, Gninja and someone I forget ran through various highlights of the expansion, including the Prestige home, the Planes of Innovation and Magic (the latter being the expansion's open-world zone), a raid dungeon and the new Crossbow weapon, usable by all classes, which levels up using xp. Plus another ten levels of course. There wasn't a huge amount of hard information but there was more than enough to convince me - not that I needed any convincing. The full details of the three versions (Standard, Collectors and Premium) are laid out here. I have never bought anything but the basic model of any EQ or EQ2 expansion yet and this is no exception. I have, however, already pre-ordered the Standard one. With the 10% Members' discount it was less than £25, which I think is very good value indeed. 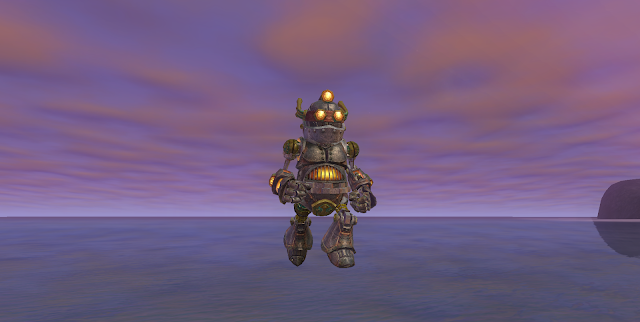 The only bonus you get with the Standard is the Clockwork Calamity illusion but it's a very nice perk indeed. In keeping with the strongly nostalgic - not to say retro - theme of the expansion, this is modeled on the classic EverQuest clockwork model, complete with key in the back. Star animator Ttobey has hooked it up with fifteen emote animations plus the usual idling suite and you can ride and fly all mounts with the illusion displaying. Well, no, actually. They said you could but you can't. Not if, like me, you have wings. You just hang in the air, apparently unsupported, because while the various "wing" mounts go in your Mount slot they actually display from the Cloak slot - I think. 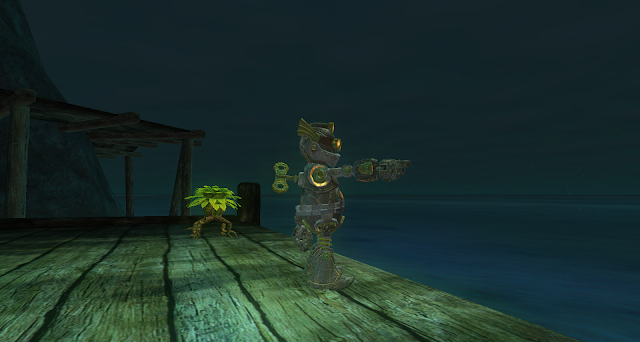 Anyway, a levitating clockwork looks pretty good, although they maybe should switch off the clanking "running" sounds. The animations are fantastic. So good I took the trouble to make a short video to show off a few of them. The Clockwork isn't just about looks. It's also a buff and a substantial one. Every recent expansion has come with a buff like this attached but I always forget to use them. So much so that, when I checked this morning, I found the last two still unclaimed. Given that I regularly complain about how slow the xp is in each expansion, especially when new levels are involved, it seems counter-intuitive (or possibly idiotic) that I don't take advantage of the buffs designed to alleviate that, not least the 10% direct buff to xp gain. Have you really got nothing better to do than just hang about? The problem has always been that the buffs come from an item that you place in your house and go visit and I just never get around to doing it. Also, they have always been one per account, meaning every character has to go to the same house to get the buff. This time is different: the buff is an illusion cast on yourself from your spellbook and every character gets their own. No excuse not to use it this time. Plus, if I recall correctly from the presentation, the buff stacks with previous buffs from the house items. So I suppose I'll have to place those after all. There's no NDA on the beta so no doubt lots more hard information will come out over the next few weeks. Also, I'm sure, a huge amount of complaints because if there's one thing EQ2 players know how to do it's complain. I think EQ2 is now the best value MMORPG available. Were you to start now as a brand new player. for the extremely reasonable price of the Standard expansion you'd get all thirteen previous expansions. And the base game, of course, is free. That's a lot of content and it's top quality, too. If you're a returning player who may have fallen out of range of the current end-game, note that you get a Level 100 boost with all versions of Planes of Prophecy. As for gear, which was a problem for some at the beginning of the last expansion, well, if Yun Zi's gear wasn't enough, there's a Quartermaster in Plane of Magic who will give (not sell) you a complete set of armor that's a slight upgrade from the Panda's set. I don't plan to do anything in the beta even though there are some good rewards for doing so. It's only a month or so until the real thing. I can wait. I might pop in to take a screenshot or two, though, and the beta forums are open to all to read, so I'm not going to try and keep my launchday experience entirely pristine. I'm sure there'll be plenty to discover even so. The inevitable doomsayers are already talking about this being the last expansion EQ2 will ever get and crowing about the imminent demise of the game itself. 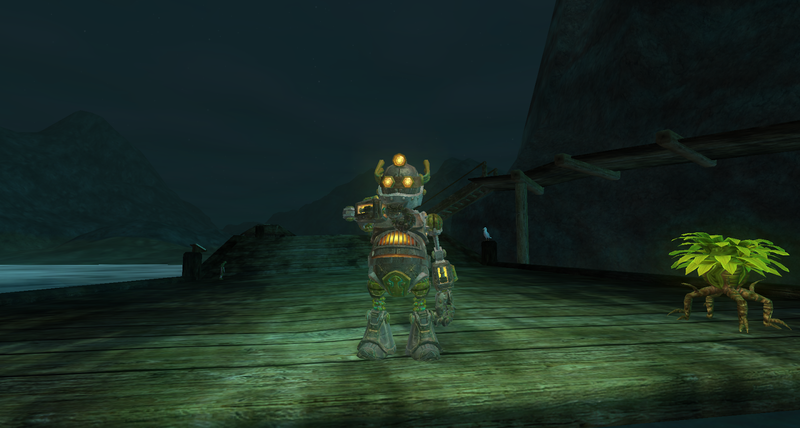 On what evidence I'm not sure, other than that no MMO can go on forever and EQ2 has been around for a while now. If longevity was based on quality rather than fashion, though, EQ2 would be safe for the rest of the century. Long may it continue! I always find the subscriber 10% discount a bit of a chuckle. I wouldn't say "no" to it! But it always makes me wonder how many non-subscribers are shelling out for EQ or EQ2 expansions. My expectation would be that something on the order of 95% of purchasers get the discount. Very good point. It reminds me of the annual Jamie Oliver cookbook (don't know if you have the pleasure in the States). A new one comes out every year priced at £26 and every bookshop in the land sells it at half price. I'm not sure if it would even be possible to pay full price if you wanted to. And yet everyone makes a huge deal about the 50% reduction and everyone rushes to buy it. "Facebook Live is the place to go. That made it a first for me. I don't have a Facebook account but apparently that doesn't matter. And I have to say that it was a cleaner interface and a less fussy experience all round than Twitch." Your experience shocked me when I read it. I do not know if things have dramatically improved, or if it is the size of the viewing audience that matters. About 6 months ago Blizzard moved their annual "Heroes of the Dorm" competition, where college teams play their Heroes of the Storm game competitively for tuition prize money, from twitch to only Facebook Live, but the stream was so bad that it was unwatchable. I had enjoyed the Heroes of the Dorm in the past, and was dismayed at how the decision was made to sabotage one of their more enjoyable events by giving exclusivity to Facebook Live. Blizzard had added a streaming option to their multi-game launcher earlier, and that was streaming to Facebook, so my suspicion at the time was that Facebook had somehow convinced some bureaucrats to give them preferential treatment as Facebook attempted to compete with twitch and youtube. I noticed that Blizzard's new deluxe e-sports arena hosted last weekend's Hearthstone HCT Summer Championship, and that was on twitch, but I don't know if there was also a Facebook Live stream available or not. Thankfully, whatever unholy alliance that Facebook had convinced Blizzard to enter into did not extend to compromising all games and events, nor compromise their e-sports arena investment. It's not unusual for me to have a twitch stream on my second monitor when casually gaming, but my Facebook Live experience has had me steering clear of Facebook Live. I've wondered how they convinced the Blizzard e-sports team to sacrifice what had been the popular "Heroes of the Dorm" event by giving Facebook Live exclusivity, but have been pleased to see that the negative reaction to it seems to have put Blizzard strongly back into the twitch camp, at least for those games that have the power to refuse to be compromised by whatever Facebook Live uses to convince the suits to give them exclusivity agreements. There were never more than around 900 people viewing live, assuming that's what the fluctuating number next to the little eye symbol meant. I imagine the Blizzard stream you watched was bigger by at least one order of magnitude. That may indeed explain why it was a smooth experience. It was also a single click to start the stream and a tidy, uncluttered screen to look at the whole time it was running. My Twitch experience, not extensive, hasn't been bad but it's been a bit fiddlier than that. I don't really care what they use so long as I can find it from a link on the official website and it works! Interesting comment about the gear 'vendor'. I took part in a JW PQ only last night and the chain legs that dropped were clearly inferior to the Yun Zi gear, I'm surprised if we're going to be replacing that so quickly when the expansion launches. I've completely missed out the housing item XP buffs as well, through blatant ignorance mind you. Is that just from Kunark or from earlier expansions too? As for the broader point, the one constant it seems for any studio is that they can never, ever do enough to stop the complaining. It can be very tiresome to face even as a fellow player - I stopped reading MMO forums a long time ago because of this. I agree wholeheartedly that EQ2 represents incredible value and richness of content compared to most MMOs. Honestly it's miraculous that DBG produce annual expansions with their small team when you look at the content dribble Blizzard produces for WoW these days (even in Legion it's not been that great and Blizzard never updates its events properly). I was surprised by the news about the vendor too. Not that there was one - after the criticism last time about having to buy crafted gear to get through the first instance I'm not surprised they added a bootstrap for that - but that the gear is an upgrade to the panda stuff. I thought the main point of the panda quests was to get people geared for the expansion but it seems redundant now. The PQ gear is also interesting. I did quite a few PQs in the spring and summer and some of the drops I got were better than the Yun Zi stuff. I was in a quandary over whether to swap them out because of the different adornment slots because other than that the stats were slightly worse. The panda gear seems to be on a par with the middling PQ drops. Gear is so hard to figure sometimes though I can't always tell what's an upgrade and what's not. If I get time I'll copy to beta and check the gear vendor to see just how much of an upgrade it is. There were xp/stat buff house items in the last two expansions, Kunark and ToT. I know because those are the ones I still have in my /claim. Before that I'm not sure - I have a feeling there was at least one earlier one that I placed somewhere but I'm not sure. My main house in Maj'Dul is now so unbelievably full of junk that there could easily be twenty of the things in there and I'd never find them!